Images from the collection of Greater Manchester Police Museum and Archives that show the prominent criminal faces in the 19th century. 1. $10,000 for Boss Tweed – The World’s Most Wanted Man. $10,000 may seem a huge reward for this escaped prisoner in the 1870s, but William M Tweed was no small fish. He is alleged to have stolen between 25 and an amazing 400 million dollars from the taxpayers of New York City via various corrupt methods. 3. Thomas Murphy – The Reluctant Subject. Murphy was convicted of a variety of crimes – chiefly stealing purses – by courts in Yorkshire and Lancashire from the 1880s to 1890s. McGrath, along with James McKevitt, were arrested after a failed attempt to blow up Liverpool Town Hall. The men – both said to be part of the Fenian movement, which was campaigning for a united Ireland – were arrested soon after the event, which only managed to cause minimal damage. Both men were tried at Liverpool Assizes the same year. On August 3rd, James McGrath, aged 32, was sentenced to life imprisonment. James McKevitt received a 15-year sentence, which he is known to have served in Chatham Prison. 5. 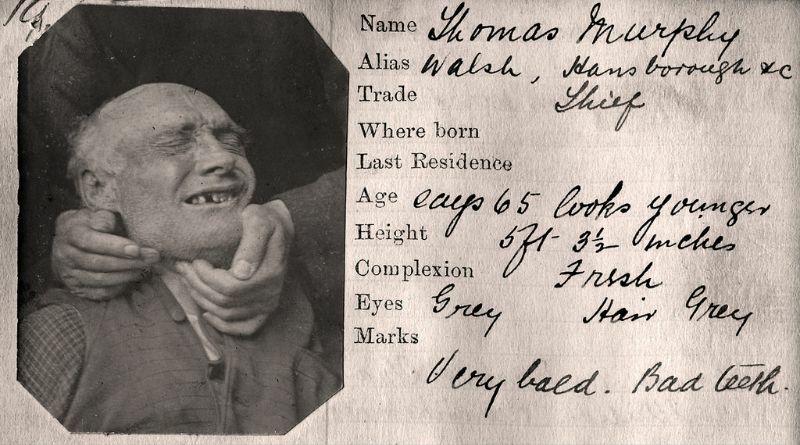 Thomas Wallace, a man with a prolific criminal career spanning three decades of the 1800s. Thomas Wallace was first sentenced to a month’s imprisonment for larceny in 1856. On release he offended again almost immediately and was sentenced to three months for a similar crime. On April 10th, 1871 he was sentenced to seven years penal servitude for stealing cloth. He began his sentence in Leeds prison but on May 29th he escaped and went on the run. He next appears in court in December the same year and is sentenced to seven years for receiving stolen goods; sentenced to twelve months in 1881 for escaping from prison; and sentenced to ten years penal servitude for another offence of receiving stolen goods in November 1882. Benjamin Keats, also known as Benjamin Walker, Benjamin Wacker and Edward Davis, repeatedly fell foul of the law between 1850 and 1890. He eventually spent half of the period in prison for a range of offences. His crimes ran from assault and larceny to, most notably, highway robbery, for which he received a seven year sentence in Glasgow in 1883. 7. Stealing and Serving Time. William Roberts, also known as Brooks, Brown, Wild and Davies. He was sentenced to prison terms from between October 1856 to December 1861 for stealing, in turn, satin, money and a watch; sentenced to seven years in 1873 for the theft of another watch; and is last reported as being sentenced to 3 months for theft in 1883. This image features Mary Bates, alias Heywood, Birchall or Solway around 1890. She is recorded in a Manchester City Police intelligence ledger as a ‘notorious thief’ well known to local officers and operating in the area. Her usual criminal method was to gain employment as a domestic servant and then abscond with her employer’s valuables at the first opportunity. The scuttlers were gangs of young people, both male and female, that menaced the streets of Manchester and Salford towards the end of the nineteenth century. They had a specific way of dressing, often including brass tipped clogs, distinctive scarves and bell bottomed trousers, they carried weapons, which included belts, knives and guns and sported colourful names. Large-scale street battles or “scuttles” took place amongst the groups, and sometimes the numbers involved swelled to hundreds. Scuttlers were similar in nature to the London gangs known as hooligans, a name still in use today. This young man, 20-year-old William Brookes, fell foul of Manchester City Police as this image appears in 1890. Mary Elizabeth Smith, convicted of larceny, obtaining money under false pretences, and more strangely “wearing apparel” saw her in and out of custody several times in the early 1890s. Mary Elizabeth Smith makes her looks more like she is going to a wedding than to prison in this image from 1893. 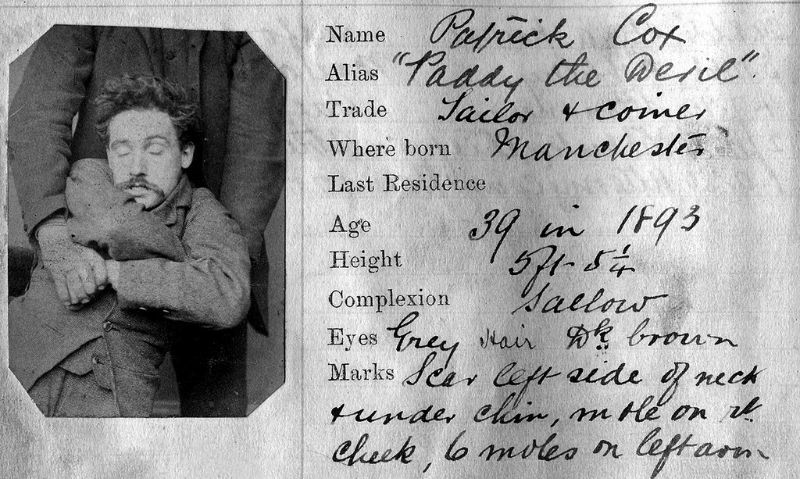 Patrick ‘Paddy the Devil’ Cox, alongside his legitimate profession as a sailor also operated a potentially lucrative sideline as a ‘coiner’ in Victorian Manchester. He may well have been a lucky man and only been sent to prison. Had he been operating a century or earlier it is likely he would have received death penalty. Catherine Day, aged 50, 5ft 1in in height, blue eyes, grey hair, a fresh complexion, and being a midwife by profession, convicted of ‘frequenting the highway with intent to commit a felony’ and sentenced to 1 month in prison in 1895. 13. The Rochdale Co-op Cheque Thief. 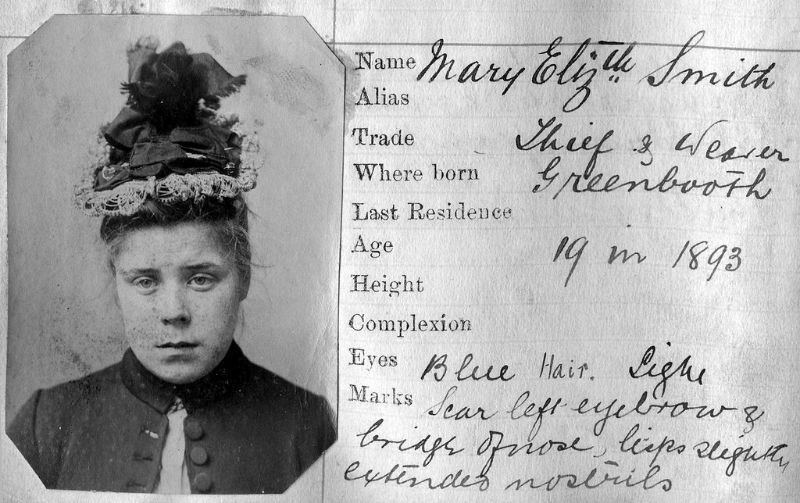 Born in Leamington but a resident of Rochdale, she first appears in police records when convicted of stealing wearing apparel on the 28th September 1889. She was fined 40 shillings by the local magistrate but it doesn’t seem to have been a deterrent for she was back in court in Liverpool only days later when sentenced to 3 months for stealing a gold watch and £4 3s 4d. In 1895, she is convicted of stealing £7 in cash and £40 in co-operative store cheques in Rochdale. She appears to have served prison sentences in both Coventry and Worcester before making her final appearance on police files after being sentenced at Salford Sessions to 3 months for stealing wearing apparel and a watch in 1897. 14. Henry Norton – Caminada’s Collar. 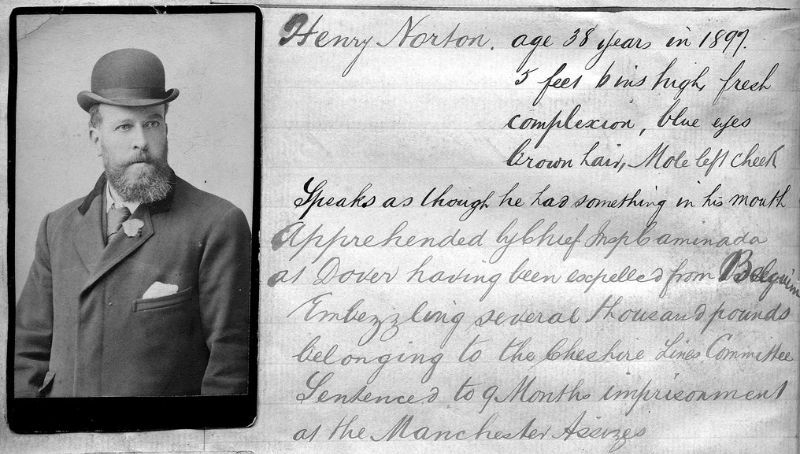 Henry Norton must have been thought a very important prisoner indeed in 1887. Manchester City Police dispatched their greatest detective, Jerome Caminada, to arrest him at Dover. Caminada, often described as the Manchester Sherlock Homes, was one of the most famous detectives of his era. He joined the Manchester City Police in 1872 and his prolific arrest rate saw him rise through the ranks. He retired in 1899 with the rank of detective superintendent as the first head of the Manchester Detective Division. 15. Alexander Thompson – The Failed Forger. 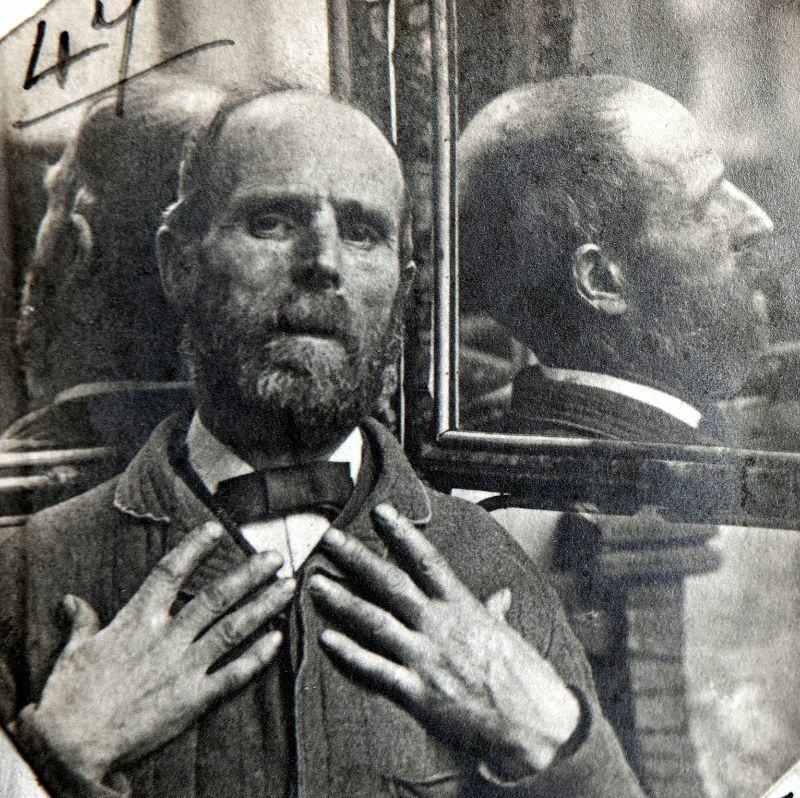 Alexander Thompson, aged 55, a lithographer, between 1892 and 1898 he had been to prison 11 times for various crimes including forgery and fraud. In 1898, he was sentenced to 3 months for larceny. 16. A Firm Favorite with the Police. James ‘Slim Jim’ Sharr, aged 60, 5ft 9in tall, grey eyes and hair and a blotched face, also noted has having at least three aliases. His trade is described as race course thief, convicted for welshing, stealing and frequenting in 1897. His last appearance in 1898 where he is again convicted of welshing. William Ingham, one of Victorian Manchester’s most persistent, sentenced to 3 months imprisonment with hard labour for stealing a watch on June 3rd, 1865; arrested for burglary, theft, office breaking and handling counterfeit currency – among other offences – over the next 45 years. In total, he was convicted 18 times and sentenced to nearly 29 years in prison, often with hard labour.